The five day state visit of Queen Elizabeth II and Prince Philip Duke of Edinburgh to Ireland was a true coming-of-age moment for Ireland, and the undoubted beginnings of a new era of cooperation between the independent state and its closest neighbour. That may sound like a variation on an endlessly repeated theme that's been coming out of the Irish media for the past three weeks, but the surprising thing is that it actually seems to be true. 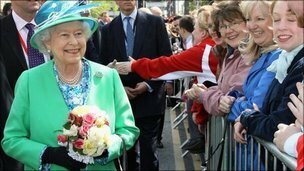 The Queen's reception in Cork today was for me (disclaimer: a Corkman) the culmination of her five day visit here. As I mentioned in a blog earlier this week, just after her arrival and first engagements in Dublin, the Queen's first moments on Irish soil were marked by a near total and highly conspicuous absence of the Irish public, a sad and stark reminder of the dissident threat which had threatened this visit since it was first announced. Thankfully the end of the royal visit, the Queen's two engagements in Cork this afternoon, provided a nice counterpoint to that threat, with the Queen freely mingling with the people of Cork and even wandering off on an impromptu walkabout of the city centre. The city's streets were thronged with people this afternoon, and the Queen, visiting the city's historic English Market, got up close and personal with market traders and locals alike. At the Tyndall Research Institute, the hi-tech spin-off of the local university developing such amazing and varied technologies as painless needless and microelectronics, the Queen met local sporting and civic figures, and had a hands on demonstration of the technologies currently under production. These niceties aside, though, the real legacy of the Queen's visit for Ireland is of course a political one. The visit -- which went even better than the optimists could have predicted -- seems to have dealt a strong blow to the more virulently anti-British movements in Irish politics. Opposing the Queen's visit, especially among the youth, was perceived as starkly old-fashioned. A friend laughingly recounted how he heard one protest organizer call a colleague to ask if he could procure more 'tin whistles' for the protest, while the Sinn Fein party's move today to strongly criticize a party mayor who shook hands with the Queen also seems incredibly stuck in the past. The puny protest that was held across the river from the Grand Parade was dwarfed by those who had just come out to enjoy the day and was largely ignored. It's not, of course, that many don't still cling to '32 county' aspirations, but there seems to be a stronger feeling than ever before that by-gones should be by-gones and that a new era of cooperation between Ireland and Britain promises far more than one of lingering rancour and resentment. My Facebook feed was an aggregation of young Irish out to enjoy the day. Dozens snapped pictures of the Queen supposedly waving directly 'at them'; others captured glimpses of the car as it sped off for the next stop on the trip. The mood was one of happiness, one of pride for Cork and for Ireland, and a feeling that this was the beginning of a bright new era. There were certainly a lot of cynics before the Queen's visit who said that it wouldn't really change anything on the ground. But unless I'm badly mistake there has been a noticeable warming in Irish perceptions of Britain and the monarchy since the Queen landed here five days ago. And that, I join most of the country in thinking, can only be a good thing.